Two Grade 6 students from Calgary have met with Starbucks' CEO after an online petition they spearheaded to push the coffee giant to deal with cup waste attracted more than 300,000 signatures. Two Calgary students have met with the CEO of Starbucks after an online petition they spearheaded to push the coffee giant to deal with cup waste attracted more than 300,000 signatures. The Grade 6 students from Terrace Road School — Eve Helman, 11, and Mya Chau, 12 — want Starbucks to commit to a fully recyclable cup to reduce what ends up in the landfill. When the coffee giant — which boasts 28,000 stores globally — caught wind of the initiative, they invited the pair to meet the CEO ahead of its shareholder meeting. "We've made it to Seattle and we have so much to tell you," the students posted to their petition site. 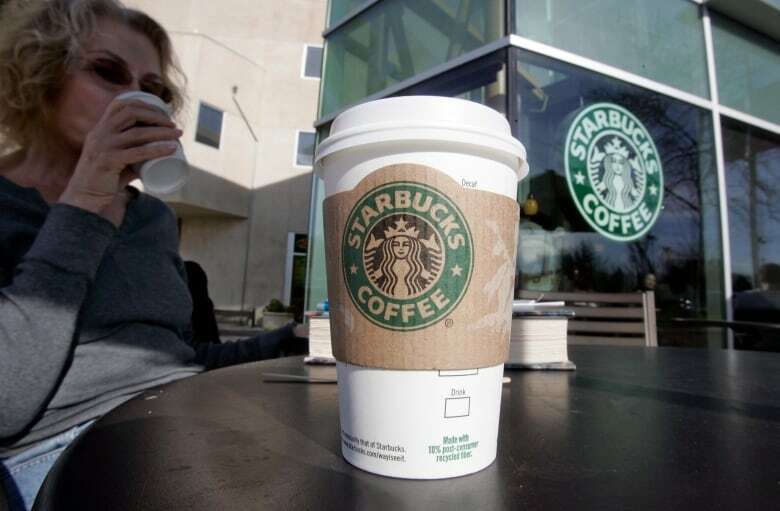 "Starbucks announced a $10-million initiative to develop recyclable, compostable cups over the next three years — this is such good news! We're so excited to see Starbucks taking this important step." A Toronto-based Starbucks spokesperson says while the initiative, called NextGen Cup Challenge, was already underway, the students were inspiring. "They had the opportunity to present their petition to Kevin Johnson, the president and CEO of Starbucks. By all accounts they had a really great conversation," said Tim Gallant. "We really applaud their commitment to helping drive a sustainable future and we think our announcement goes even beyond what they are asking for in their petition. Everyone is really on the same page and committed to producing the most sustainable cup." The challenge is about reducing waste, Gallant said. "That's really creating an open-source forum where global leaders will be able to fast-track a solution to producing the world's most recyclable and sustainable cup. We think that's something that is going to take a lot of minds to create," Gallant said. 2015 | Coffee cups: Do Starbucks and Tim Hortons really recycle? But Helman and Chau aren't done yet. "We also spoke about what more can be done, like making sure people bring their own reusable cup when they buy a coffee. Reusable cups are the best solution, but currently less than two per cent of Starbucks hot drinks are served in them," they said.